A warm Southern California day almost always means a dry-slick track at the end of the night in the desert air of the Inland Empire. Combine that with a full card of Sprint Car racing and everyone knew what was going to happen: The corners were going to get polished up with all those wide right rears, and drivers with car handling skills would rise to the top. R.J. Johnson (51), Brody Roa (91) and Cody Williams (44) battle in the front. An early surprise for the evening was Cody Williams, driver of the #44 USAC/CRA car. The departure of John Jory Motorsports left all three Williams brothers seeking a ride. Austin Williams found a seat with the #92 Moose Team. Logan is sitting out for the time being. Cody Williams found enough personal funding and some help from Trench Shoring to race the local events. Cody Williams arrived at the track on a flatbed trailer – a far cry from 10-years of hauling in the iconic black Jory Motorsports hauler that became a familiar sight in the infields of California dirt tracks. Harkening back to an earlier day, Cody pulled all the resources together and built the car at his house. He placed third in qualifying. 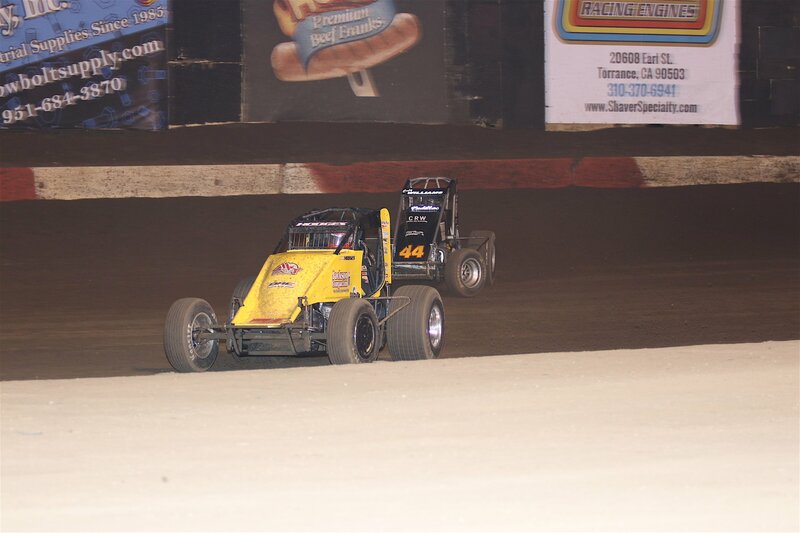 Starting mid-pack, he jumped to the front and led most of his heat race on Saturday, getting passed on the last lap in a drag race to the flag. It appeared that Cody was going to be a contender in the feature. However, the black #44 flipped on the opening lap while moving toward the front. Austin Williams in the Sertich Moose-Mobile. Austin Williams went on to qualify in Fifth, then battle with 7-time CRA Champion Damion Gardner in the Second heat. Austin took Second and claimed a decent starting place for the Sertich-owned Moose-Mobile in the Feature, where he finished in Third place. Richard Vander Weerd also looked fast as he set quick time in qualifying. Driving smartly in the heat, Vander Weerd placed himself solidly in the pack for the feature, where he did a bit of nifty driving to finish Second in the evening. R.J. Johnson showed he was a force to be dealt with by winning his heat and leading the first half of the feature. Flipping on lap 16, Johnson finished in 16th with a car much stronger than the final results. Roa took over the lead from Johnson and held off challenges from Richard Vander Weerd. After taking a couple of years off, Matt Mitchell returned to show that he had not lost a step. Equipment issues haunted him late in the race. The next event for the AMSOIL USAC/CRA Sprint Car Series will be the April 13th “Sokola Shootout” at Perris Auto Speedway. 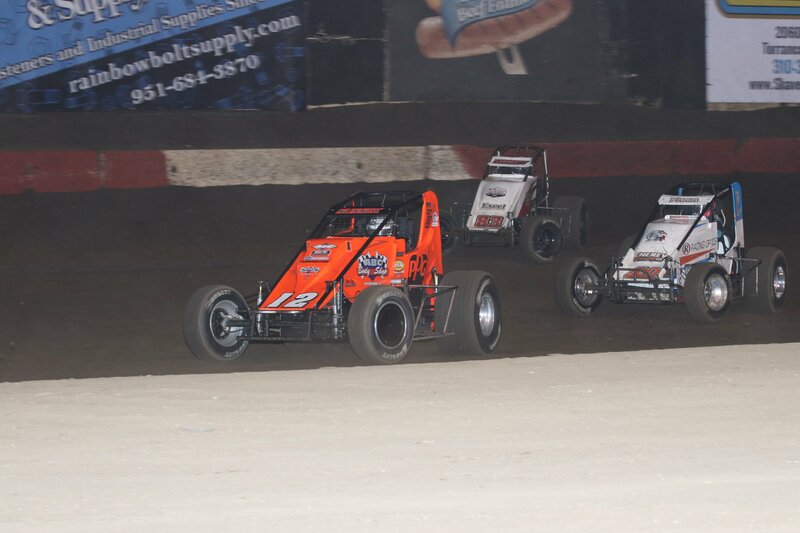 For more information on USAC/CRA, visit www.usacracing.com. On his qualifying lap, Alex Bender did a 360 in turn Two, stayed in the throttle and got the car pointed in the right direction and continued on without hesitation. C.Williams flipped on lap 1 of the feature. Bender and Johnson flipped on lap 16 of the feature.